Anouck qualified as a veterinarian from Ghent University (Belgium) in 2001 and defended her thesis about the welfare of horses at the Complutense University of Madrid (Spain). Subsequently she obtained a PhD in Ethology at the University of Namur (Belgium) in 2009, where she has shown that positive training improves military dog’s welfare and performance. Since 2013, Anouck is European Veterinary Specialist in Behavioural Medicine (ECAWBM-BM). 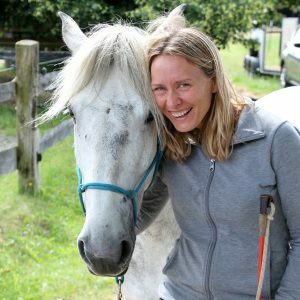 As a member of different Veterinarian Associations in Animal Behaviour (ECAWBM, ESVCE, VDWE, SFEV) and in Natural Integrative Medicine (Complevet), Anouck is committed to learn continuously in order to maintain a high level of competence and excellence in these fields. Anouck is teaching animal behaviour in collaboration with different institutions as Odisee University College (Belgium: International Postgraduate Course in Companion Animal Behaviour and Welfare of Odisee University College), Ecole National Vétérinaire Alfort (France: Postgraduate Course in Veterinary Behavioural Medicine), Iforec… She is a frequent lecturer in Belgium and abroad on the topic of Animal Behaviour and human-animal interactions. Anouck studies the influence of olfactory enrichment on emotions of humans and animals. Different studies and projects in this field are currently conducted. Anouck is passionate about the prevention of behavioural and medical problems and about the improvement of the relation between humans and animals. Within Vet Ethology, she will figure out the most appropriate treating or training programme for the pets, in accordance to their individual needs. Find here Anouck’s complete CV and list of published (peer reviewed) articles or discover the interview realized by Dr. Laure-Anne Viselé, zoologist.